Four pieces believed to be from the same rough, with very different characteristics - all unique and priced to sell. 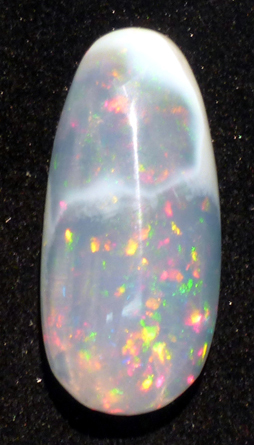 Photo was taken using a flash, which is the norm when photographing Opals for us. It allows the capture of some of the play of color, but the predominant colors might be different due to angle and wavelengths within the light source vs. overhead lights. 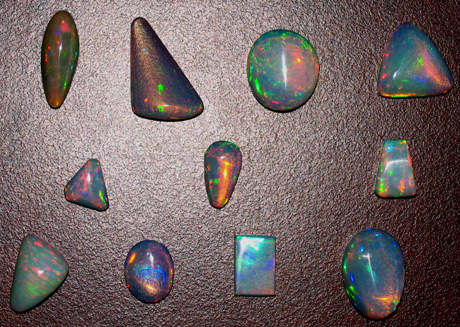 Interesting parcel of one-of-a-kind Ethiopian Opal, 5 pieces, with each piece being unique for some reason. 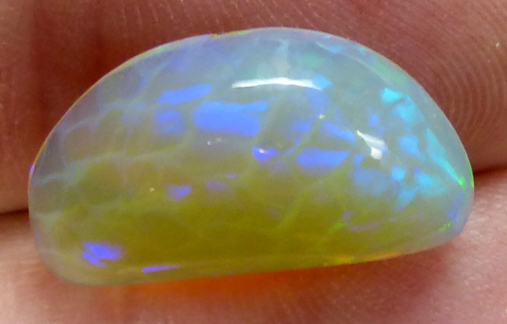 A large tongue shaped Opal that screams design a unique piece for me! 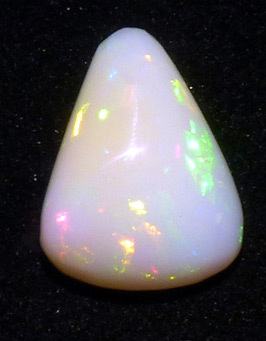 Weighs 8.94cts and show color throughout with some broad red orange flashes near the bottom as it goes slightly more transparent in that area with less play of color. 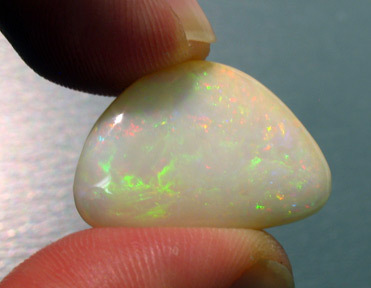 A Surprised Deep Below the White Opal and Mud! 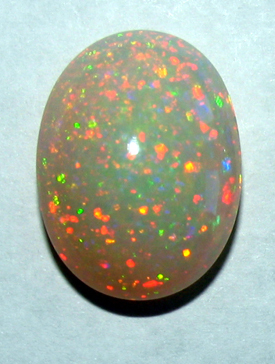 Large newly cabbed (just a few days ago) by our local cutter 11.29ct Ethiopian Opal measuring approximately 20mmx13mm. 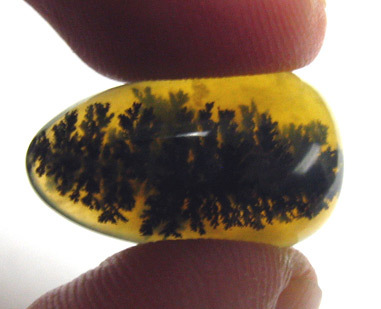 This is a unique piece in size and in coloring, as some might call it a bicolor. 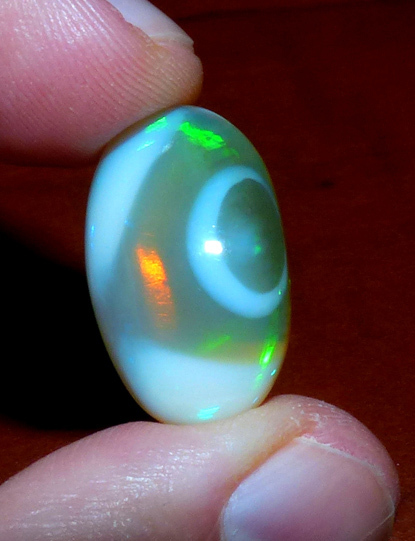 About 60% of this gemstone is white Ethiopian Opal and the other 40% is a yellowish with a tiger pattern. We have seen Honeycomb and other patterns, but not a tiger pattern. There is play of color across the piece and lots of wonderful flashes of color. 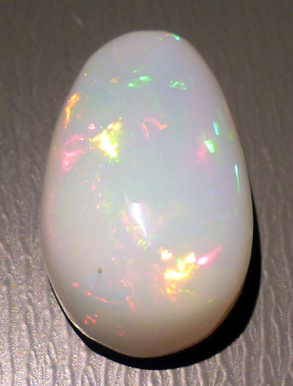 The photo above is a very decent photo shows a body color of more blue on top and a darker yellow on the bottom; in reality, it is the more white opal on top and light yellow on the bottom. The display of color similar to the above is there under the proper lighting conditions. Note if you look really closely at the striping on the side, it is actually what is called the "honeycomb" pattern seen in this material. 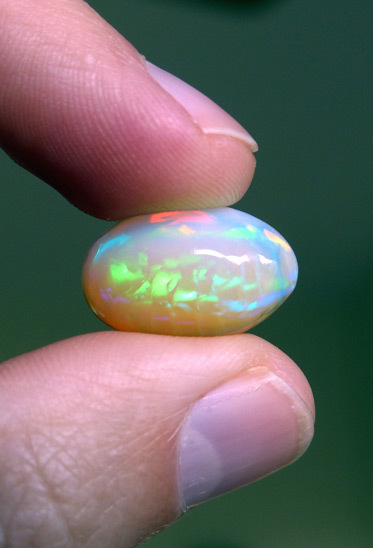 It can cost more if the Opal has the honeycomb pattern.... You won't find anything of this size and play of color in a store. You won't find a unique piece like this with the striping as well as the play of color - at least not that we have seen previously You won't find a better price! (zlmy-13-01a) $750 Not the best video, but you can view it below. 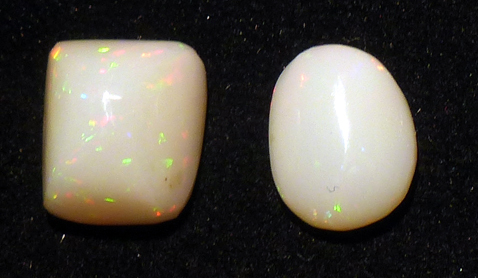 Three very fine opals just back from the cutter. Really nice play of color. 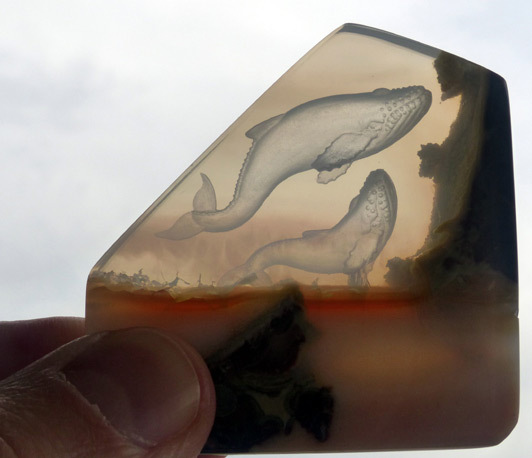 Largest one is a pear shape and measures about 12mmx7mm. Rounds are uncommon, but there is one here. The smallest one has some matrix and undercutting in one area which causes the perimeter to show an issue, but set in a bezel it will not be a problem. Color is great as is the price. 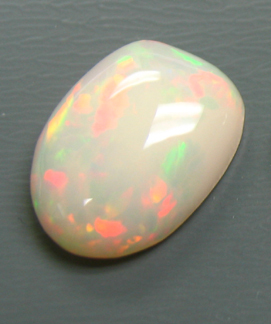 Parcel weighs 2.23cts - $625 (akgje-13-01bp) Opal is tricky when cutting from the rough and we thought we would obtain two very large and fine pieces. Unfortunately, we got much smaller pieces but still of very fine quality. We lost our shirt on the rough and offering what we did obtain from the rough at a great price. 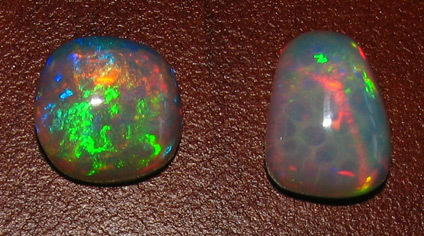 B - 6.63cts total weight of two Ethiopian Opals. Unfortunately, the large and costly piece of rough had issues and only these smaller pieces resulted. The squarish piece has color but not as much as the shield to the left or two above it. The oval has little color. Photo doesn't capture actual play of color which is still better than the photo. Cost of rough and cutting was approximately $1000. (ethop-10-03p) $150 - good for a collection or even setting into jewelry. 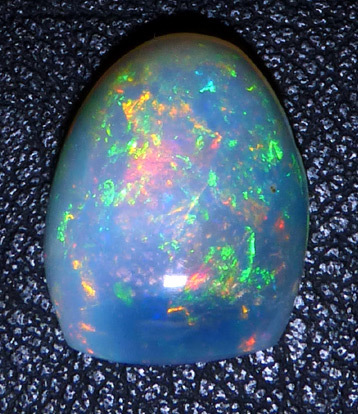 Ethiopian Opal cabbed from All That Glitters rough. Photo shot under simple office fluorescent lights. Freeform weighing 9.91cts (ethop-10a) $743 Not as intense in color as the above pieces, but it is large and does display color. 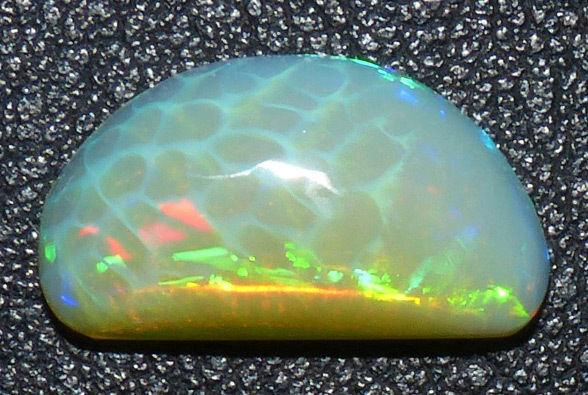 Ethiopian Opal. 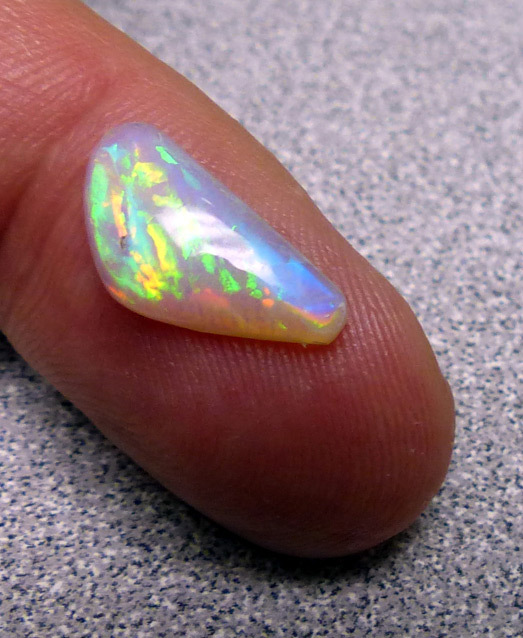 The smallest one shows broad flashes of color, the largest one has smaller flashes of color. The middle one shown above has flashes of color, but not very strong. Cabbed in the US by our cutters. 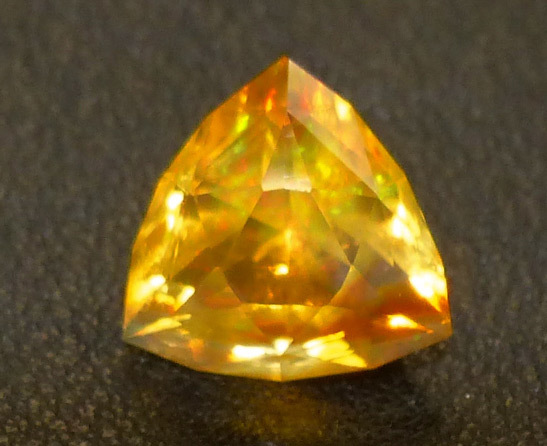 7.42ct Lazy/Sleepy Pear: $200/ct (This shape is not a perfect pear shape and that was intentional. 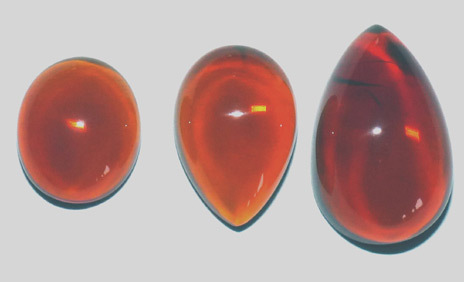 This Lazy or Sleepy Pear Shape will enable some interesting silver or gold work to be performed, creating a very unique piece.) SOLD! Photos do not do these gems justice. 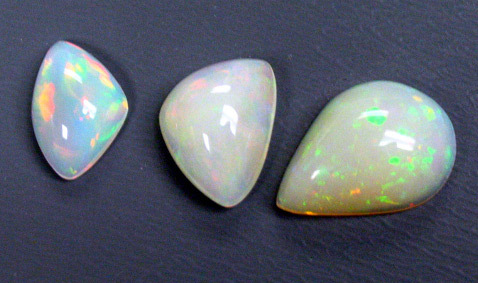 As one can see from the pricing per carat, the two fine ones are on the left and right; the middle one is a nice Opal, but doesn't have as much play of color as its two companions.